It felt like Mommy had just breathe a sigh of relief because of the cough the Little One had suffered was just healed. But, how come, the cough is heard again? Upper Respiratory Tract Infection (ARI/Acute Respiratory Infection) is indeed often found in young Little Ones between the ages of 6-23 months, with the manifestation of this condition can be in the form of coughing symptoms. Although usually the symptoms of coughing will subside by itself but that does not mean that Mommy can stop worrying about the condition of your Little One, right? You need to remember that coughing is the body's natural response as an airway defense when there is interference from outside. This response serves to cleanse mucus or irritating factors such as dust or smoke to be let out from the lungs. Cough rarely indicates a serious illness and usually will heal itself within 2-3 weeks. The Food and Drug Administration (FDA) does not recommend the provision of cough and cold drugs that are sold freely for the Little Ones who are under 2 years old. Moreover, the effectiveness of cough medicine has also not been fully proven. Give nutrients that contain nucleotides and lactoferrin. Both types of proteins play an important role in increasing antibodies. Nucleotides are proteins that the body needs to be able to strengthen immunity towards infections and support the health of the digestive system. Nutrition will be absorbed and channeled properly if the digestion of the Little One is healthy. Nucleotides also play an important role in the formation of the metabolism of the Little One. Lactoferrin is a type of protein that binds to iron. Various functions of lactoferrin including as an antimicrobial, a regulator of iron absorption in the intestine, and a regulator of the body's immune system. Lactoferrin works on white blood cells to provide immunity. With a maximum immune system, your Little One will not be infected more severely than viruses and bacteria in the respiratory tract. Your Little One will be prevented from cough, cold, and ARI (Acute Respiratory Infection). Reduce the activity of the Little One, let him/her rest a lot. Place a humidifier in the Little One’s bedroom. This will keep the air moist and reduce dryness in the airways and throat. Increase your intake of fluids, especially warm ones such as soup. Warm food and drinks can help thin mucus or phlegm that attaches to the respiratory tract. When your Little One is sleeping, raise the position of his/her head. This will make your Little One breathe easier when coughing. Maintaining the health of your Little One by fulfilling his/her nutritional needs including giving him/her nutrients that contain nucleotides and lactoferrin which are useful in increasing his/her body's immunity towards infections such as a cold and cough. Applying hand washing habits every time your Little One and all family members are done with an activity. By knowing the independent management of coughing on your Little One and the right way to prevent him/her from getting sick, Mommy doesn't need to be worried anymore. Hopefully, the Little One is always healthy! 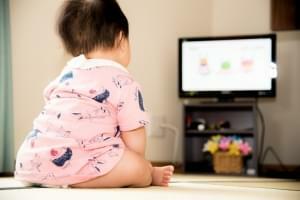 Is There Any Benefit Of Watching Tv For Toddlers? Do you know that in the last 30 years, the age of the Little One to begin on getting used to watch television continues to decrease? Now, the average age of the Little One in starting to get used to watch television is since the age of 4 months. Previously, the Little One started to watch television at the age about 4 years. Reading a story book or fairy tale is a very enjoyable ritual. It does not only function as a means of entertainment but can also be a medium of education to teach a variety of values or norms of life. Do You Want Your Little One to Be Smart? These Five Nutrients Will Do! Parents are filled with hope that their child may grow healthy and smart. All these times, there is a presumption that a child’s intelligence is derived from genetic factors or being inherited. Meanwhile, there are many factors that influence your little one’s intelligence, one of which is a highly nutritious food intake.